In this program, we need to calculate the sum of nodes present in the binary tree. First, we will traverse through the left sub-tree and calculate the sum of nodes present in the left sub-tree. Similarly, we calculate the sum of nodes present in the right sub-tree and calculate total sum by adding the root?s data. 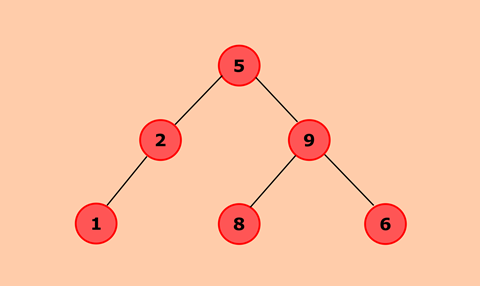 For the given tree, sum of nodes of the binary tree will be 1 + 2 + 5 + 8 + 6 + 9 = 31. It checks whether the root is null, which means that the tree is empty. If the tree is not empty, traverse through left subtree, calculate the sum of nodes and store it in sumLeft. Then, traverse through the right subtree, calculate the sum of nodes and store it in sumRight. Finally, calculate total sum = temp.data + sumLeft + sumRight.